Jake Santees is 99 years old. Jake brews his own whiskey, Ole' Death Whisper, from a secret recipe passed on by a dying Indian man. He lives on his farm with grandson Tiny. Tiny likes to build fences. 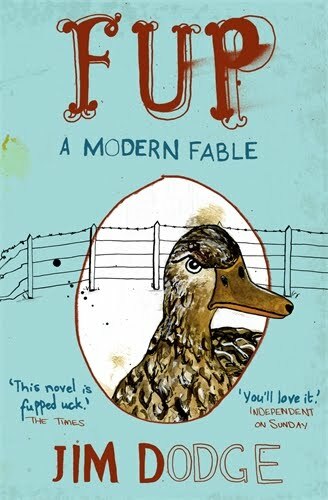 Fup is a duck, found by Tiny when a newly-hatched duckling, and saved by a drop of the whiskey. Together they hunt for the wild pig Lockjaw that terrorises Tiny and his fences. Not making sense? Don't worry. It will, kind of. First published in 1983 this has quietly become a modern classic. This beautifully illustrated edition was published by Canongate in 2009. Jim Dodge lives on an isolated ranch in California, west of Sacramento. His sparse, matter of fact prose is bizarre, surreal and in the spirit of Cormac McCarthy and the expanses of the mid west. This is 'A Modern Fable' well worth the read. Not one for the kids though.